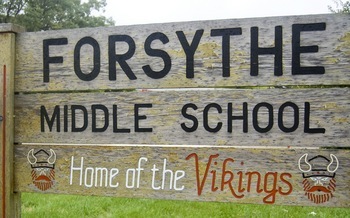 Posted on Mon, Feb 13, 2012 : 6:30 p.m.
Students at Forsythe Middle School will experience heightened security Tuesday after a bomb threat mentioning Feb. 14 was found on a bathroom wall in the eighth-grade corridor. A bomb threat mentioning Feb. 14 was found in a bathroom at Forsythe Middle School. District spokeswoman Liz Margolis told AnnArbor.com Monday that the threat was found after school on Feb. 7. The school was searched immediately and nothing was discovered. “We do not expect any actions on this threat, nor do the police, but we are being extra vigilant,” said Forsythe Principal Janet Schwamb in a letter sent home to parents Friday. Margolis said Forsythe has had a rash of bomb threats throughout the years. Typically, however, the threats are non-specific, she said. Because this one cited a specific date, the district urged taking additional precautions and sent home two notices, she said. “As with any disruption like this, we will prosecute if we find out who did this. And we tell families this and we tell kids this,” Margolis said. The threat is impacting two schools. Ann Arbor Open canceled its joint orchestra practice at Forsythe on Tuesday and is hosting it at Ann Arbor Open instead. “The district has taken this threat seriously and put all necessary safety measures in place,” said AA Open Principal Kit Flynn in an email to parents Monday. “But given the nature of the threat, and the precautions the staff at Forsythe will need to follow, we have decided to cancel our planned rehearsal at Forsythe for tomorrow. In the letter Schwamb sent to Forsythe parents Friday, she said students will be required to enter the school through the main lobby on Tuesday where backpacks will be searched by district staff. She said school bathrooms will be locked all week during class time. Some will be open during passing time with staff stationed outside the door. If students need to use the restrooms during class, they will be able to do so by obtaining a pass from the main office, the letter says. “On Monday evening and through the night until Tuesday morning, the Ann Arbor Police Department has arranged for a police dog to be in the building along with police and district staff to search the school as a precaution,” Schwamb said. Tue, Feb 14, 2012 : 4:18 p.m. Wondering if the kids who are scared are the same ones who have parents who foolishly let them play first-person shooters. I know one kid who does and is, and one who doesn't and isn't. Sure, that's a sample size of only two, but still it makes me wonder. Tue, Feb 14, 2012 : 3:49 p.m. So, these bomb threats have been turned over to the FBI for investigation, correct? Because if they haven't, they should immediately! Tue, Feb 14, 2012 : 1:01 p.m.
For those of you making light of this - shame on you! I have a child who couldn't attend school today because of nightmares last night. the staff has been great in trying to make the kids feel safe and we, as parents, are doing the same. However, kids are scared and the subject is serious. No matter how strongly I feel that there is no real threat, our kids are affected and it's sad. Tue, Feb 14, 2012 : 4:15 p.m.
Tue, Feb 14, 2012 : 2:34 p.m.
@Mike - if you read my post, you would see that the parents are trying to make the kids feel safe. I know I am not making a big deal of it, but one cannot control how another person feels. Oh yeah, and how do you make a kids feel better by comparing their lives with those of others? They are young and self-centered and although can be aware of what is going on around the world, it is their world they understand best. Their fears are real enough. My comment earlier was not meant to make light of the situation, but rather to point out that there is something seriously amiss if, despite the consequences, students feel the need to scrawl threats on a bathroom wall. While some might write it off as a prank, I think it is a serious indicator that the kids are feeling upset over there. Tue, Feb 14, 2012 : 2:23 p.m.
Just relax and assure your kids everything is going to be OK.........Do you realize how many bomb threats are made in this country everyday? It's wise to check it out but not to have to get therapy over it. Ask yourself how it would feel to live in Israel or somewhere where terrorism is a daily fact of life. You learn to deal with it and trust in God. Do they worry every day they go to school that they could get hit by a car, bitten by a dog, or beaten up or robbed by some punks on the way home? Probably not. So why do they worry so much about something that is even more improbable such as a bomb threat? Tue, Feb 14, 2012 : 1:48 p.m.
My child was also too anxious to attend Forsythe today. While we as adults might not feel it's a serious threat and think it's just something to joke about, put yourself in the position of the students there. Poking fun at the situation does nothing to help. Tue, Feb 14, 2012 : 5:08 a.m. I learned long, long ago that information on a Forsythe bathroom wall can be disappointingly inaccurate. Tue, Feb 14, 2012 : 5:51 p.m.
Tue, Feb 14, 2012 : 2:02 p.m.
OMG, I just spit coffee on my keyboard. Well done. Tue, Feb 14, 2012 : 1:51 a.m.
Maybe it is in protest of the culturally insensitive mascot? Tue, Feb 14, 2012 : 6:04 p.m. Speaking as a descendant of said culture, I approve of it. Tue, Feb 14, 2012 : 5:50 p.m.
My thought was the mandatory science fair. Tue, Feb 14, 2012 : 1:24 a.m.